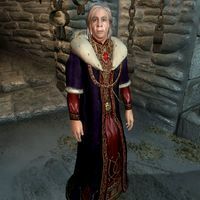 Emperor Uriel Septim VII (3E 346 - 3E 433; ruled 3E 368 - 3E 433) is the son of Pelagius IV and twenty-first emperor of the Septim dynasty. 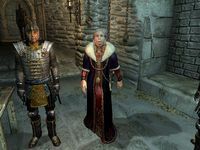 He plays a role in four Elder Scrolls games - Arena, Daggerfall, Morrowind, and Oblivion - which collectively cover the last forty-four years of his 65-year rule. Oblivion opens at the very end of Uriel VII's reign, shortly following the triple assassination of his grown sons Geldall, Enman, and Ebel. 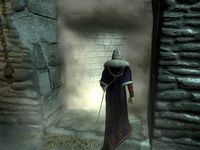 Having been advised by his councilors to go into hiding, he attempts to flee the Imperial City through a secret underground tunnel which passes through your prison cell. Here, he invites you to join his entourage and asks you to find his illegitimate son and bring him to the palace to be crowned emperor. 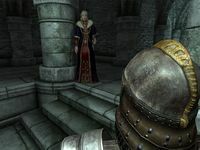 He also gives you the Amulet of Kings, which must be worn at all times by a member of the Septim bloodline, or the barrier between Tamriel and Oblivion will dissolve. 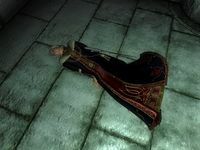 Uriel is killed shortly afterward by members of the Daedra-worshipping Mythic Dawn cult. 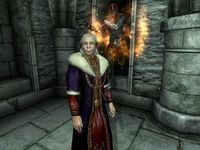 Shortly after his death, portals to Oblivion begin appearing all over Cyrodiil and the forces of the Daedric Prince Mehrunes Dagon invade Tamriel. The emperor wears the Amulet of Kings, and an emperor's robe, with a pair of matching shoes. He wields a silver shortsword. He also carries a spare pair of shoes. The Emperor walks up to you after he notices you. "I was born 87 years ago. For 65 years I've ruled as Tamriel's Emperor. But for all these years I have never been the ruler of my own dreams. I have seen the Gates of Oblivion, beyond which no waking eye may see. Behold, in Darkness a Doom sweeps the land. This is the 27th of Last Seed; the Year of Akatosh 433. These are the closing days of the 3rd Era, and the final hours of my life." Uriel: "My sons...they're dead, aren't they?" Renault: "We don't know that, Sire. The messenger only said they were attacked." Uriel: "No, they're dead. I know it"
Renault: "My job right now is to get you to safety." Uriel: "I know this place ... the prison?" Renault: "Yes, your Majesty. Beneath the Legion Compound. We're headed for a secret passage known only to the Blades. No one can follow us through here." Follow the Emperor to escape the prison. Uriel: "You ... I've seen you...(goes into conversation mode) Let me see your face... You are the one from my dreams... Then the stars were right, and this is the day. Gods give me strength." Uriel: "Assassins attacked my sons, and I'm next. My Blades are leading me out of the city along a secret escape route. By chance, the entrance to that escape route leads through your cell." Uriel: "Perhaps the Gods have placed you here so that we may meet. As for what you have done... it does not matter. That is not what you will be remembered for." Uriel: "I am your emperor, Uriel Septim. By the grace of the Gods, I serve Tamriel as her ruler. 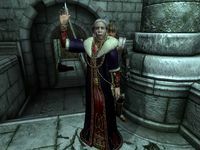 You are a citizen of Tamriel, and you, too, shall serve her in your own way." *These two questions can be asked in any order. You: "What should I do?" Uriel: "You will find your own path. Take care... there will be blood and death before the end." You: "I go my own way"
Uriel: "So do we all. But what path can be avoided whose end is fixed by the almighty Gods? Baurus: "Are you all right, Sire? We're clear for now. Baurus: "She's dead. I'm sorry, Sire, but we have to keep moving. Here you must find your own path. But we will cross paths before the end, I am sure of it. Baurus: "I think that was all of them. Let me take a look around." Uriel: "Have you seen the prisoner?" Baurus: "Do you think he/she followed us? How could he/she?" Uriel: "I know he/she did." Uriel: "Not yet. Let me rest a moment longer." *Glenroy will cycle through these, with Uriel giving the same answer. Glenroy: "Dammit, it's that prisoner again! Kill him/her, he/she might be working with the assassins." Uriel: "No. He/she is not one of them. He/she can help us. He/she must help us." Glenroy: "As you wish, sire." Uriel: (If you are not close enough for him to enter conversation) "Come closer. I'd prefer not to have to shout." If you ignore him, he'll say "I need your help. Please come with us." If you ignore him further, he'll add "Don't be afraid. My guardians will not harm you." Uriel: "They cannot understand why I trust you. They've not seen what I've seen. How can I explain? Listen. You know the Nine? How They guide our fates with an invisible hand?" You: "The Nine guide and protect us./I'm not on good terms with the Gods./I don't know. I don't think about it." Uriel: "I've served the Nine all my days, and I chart my course by the cycles of the heavens. The skies are marked with numberless sparks, each a fire, and every one a sign. I know these stars well, and I wonder... which sign marked your birth? (After you pick Birthsign) The signs I read show the end of my path. My death, a necessary end, will come when it will come." Uriel: "Your stars are not mine. (Dialogue differs depending on which birthsign you picked.)" Uriel: "My dreams grant me no opinions of success. Their compass ventures not beyond the doors of death. But in your face, I behold the sun's companion. The dawn of Akatosh's bright glory may banish the coming darkness. With such hope, and with the promise of your aid, my heart must be satisfied." Uriel: "No trophies of my triumphs precede me. But I have lived well, and my ghost shall rest easy. Men are but flesh and blood. They know their doom, but not the hour. In this I am blessed to see the hour of my death... To face my apportioned fate, then fall." You: "Where are we going?" Uriel: "I go to my grave. A tongue shriller than all the music calls me. You shall follow me yet for a while, then we must part." "I can go no further. You alone must stand against the Prince of Destruction and his mortal servants. He must not have the Amulet of Kings! Take the Amulet. Give it to Jauffre. He alone knows where to find my last son. Find him, and close shut the jaws of Oblivion." My guards are strong and true, but even the might of the Blades cannot stand against the Power that rises to destroy us. The Prince of Destruction awakes, born anew in blood and fire. These cutthroats are but his mortal pawns. Take my Amulet. Give it to Jauffre. I have a secret son, and Jauffre alone knows where to find him. Find the last of my blood, and close shut the marble jaws of Oblivion. "Your Amulet? Then this is 'Goodbye'?" "This is where my journey ends. For you though, the road is long and dangerous. Now, give me your hand." "What Amulet?" "The Amulet of Kings. It is the Empire's sacred emblem of rulership. It must pass to the last of the Dragon's Blood. Keep it safe from the pawns of the Destroyer." If you choose "What Amulet? ", the following dialogue will occur. "So, this is it?" "For me, it ends here. You are our only hope to stem the blood tide. Give me your hand." Regardless of your previous selection in dialogue, the following three options will end the conversation. "With all my heart... farewell..." "Stand true, my friend. May your heart be your guide and the gods grant you strength." "I won't forget you..." "Remember me, and remember my words. This burden is now yours alone. You hold our future in your hands." "I'll take it from here..." "Then go. Take with you my blessings and the hope of the empire." "This can only lead to your death. My guardians are sworn to protect me." "Your destiny calls you down a different road. Please, help us." "This is only the beginning. Worse is yet to come." - When the Assassins first attack. "Come with us. Your destiny is bound up with mine, and with the fate of Tamriel itself." - When talked to after rejoining him. Uriel Septim VII is voiced by veteran actor Patrick Stewart. The line "A tongue shriller than all the music calls me" is an allusion to Act 1, Scene 2 of Shakespeare's Julius Caesar, when Caesar remarks "I hear a tongue shriller than all the music ...". Patrick Stewart, who voices the Emperor, is a well-known Shakespearean actor. It is possible he will use a normal Imperial voice if you yield to him after combat.